Martha Tom knows she's not supposed to cross Bok Chitto, but she does one day in search of blackberries. Martha Tom hides behind a bush when she hears someone and soon she is discovered by a tall slave. He instructs his son, Little Mo, to help Martha Tom get home. A friendship begins between Martha Tom, Little Mo and his family. A unique and wonderful story about friendship and freedom. 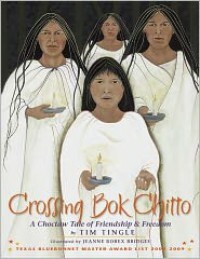 It is based on Choctaw lore and I thought it was a great story with good illustrations.